Often mistaken for Cheese Magneteer Don Adams. 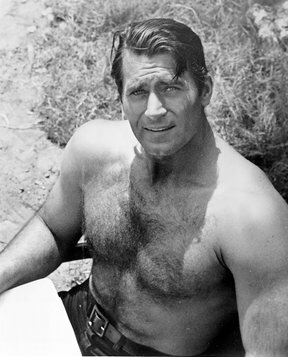 Our pick for Cool Actor of the Week this time around is one of the biggest, manliest dudes ever to stalk across the TV screen — Norman Eugene “Clint” Walker. Born in Hartford Illinois, Walker worked in a factory and on a river boat before joining the Merchant Marine at the age of 17, near the end of WWII. How many actors have that sort of thing on their resume nowadays? After a few smaller roles, his imposing physique (6′ 6″, 48″ chest, 32″ waist) landed him the role of Cheyenne Bodie on Cheyenne. The classic western series aired from 1955 to 1962. Check out the manly brawl between Clint and Leo Gordon in the clip below — it’s like watching the Hulk fight the Hulk. I hadn’t seen Cheyenne or The Dirty Dozen (he portrayed Samson Posey) at the time, so my first exposure to Clint Walker was in the TV movies Scream of the Wolf (1974) and Killdozer (also 1974). I also have vague memories of the 1974 TV series Walker starred in, Kodiak — and who can forget 1977’s Snowbeast? I couldn’t find any good clips specifically of Walker from The Dirty Dozen, but here’s the trailer. Now I really wanna see the movie again. Walker worked steadily up until 1998, with his voice role as Nick Nitro in Small Soldiers. Nowadays, Walker and his wife Susan maintain Walker’s official website, where you can order autographed photos, books and DVDs. Meanwhile, Cheyenne is available on Netflix streaming and can be seen on the Starz Encore Western Channel.